I think it's pretty clear why there's still so much uncertainty over JFK's death, so many decades after the event. A) Send Boba Fett (or an equivalent) in disguise to do the hit, but staged it for a human to take the blame? B) Hire humans directly (Cubans, Mafia, Soviets, CIA, etc.) to do the deed? 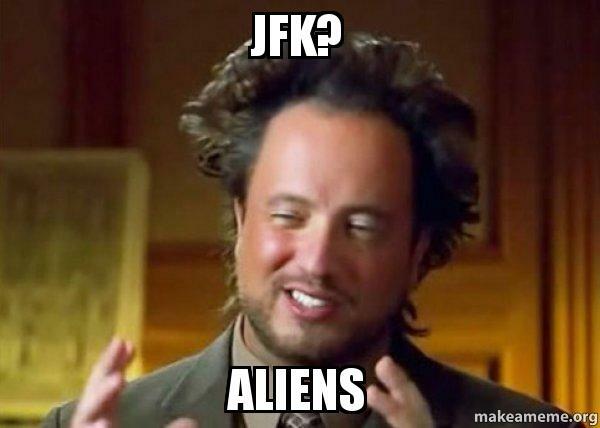 C) Simply rescue/abduct JFK before the shooting, replacing him with a dud clone, because they didn't want to interfere with a key event in history? D) Put an implant in you that prevents you from disclosing any of the above? Blink once for yes, twice for no. Inquiring minds want to know! Our wargaming future depends on it! F) JFK is alive and living in a Texas rest home. Bubba-Ho-Tep has it right. "C) Simply rescue/abduct JFK before the shooting, replacing him with a dud clone, because they didn't want to interfere with a key event in history?" Proof found! Here's an early assassination attempt. PS. At times they were way better than Mulder and Scully. Do we know for sure that anyone called "JFK" really ever existed? It could all just be false info planted in our consciousness by said aliens. After, all JFK could just stand for "Just For Kicks". After all, Nov. 22nd is the date on the old Venusian Astral Calendar that correlates to the modern day April 1st. You are so right. Maybe we've been fed nothing but lies about someone who never existed. Clearly he's spoken of as a saint and savior. That right there sends up a red flag. I mean seriously, what politician is really a saint and savior, right? And, if he never existed then … he never died. Case closed. The same reason LBJ liquidated SECNAV Forrestal.